Ahoy Mateys! In honor of "World Read Aloud Day" we wanted to share one of our favorite children's books to read aloud. 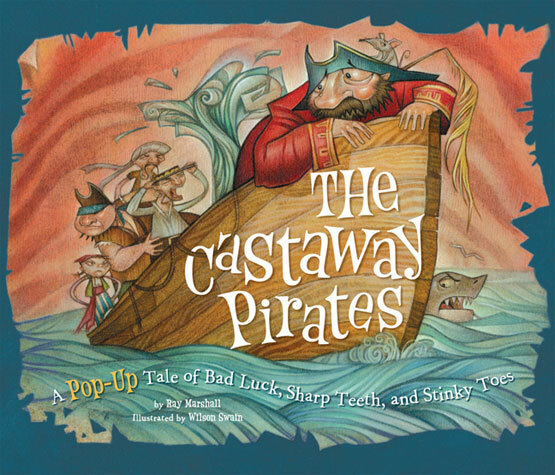 The Castaway Pirates, by Ray Marshall, is my son's favorite book right now. We shared this video back in September for "Talk like a Pirate Day" but I thought it be appropriate for today to encourage others to pick up a book and read it aloud. As soon as I started reading The Castaway Pirates, a natural Pirate tune started to come out from the rhyming sentences. Will the shark eat the pirates with stinky toes? Watch our video below to find out. The ending of the story makes us laugh everytime. The pop-up illustrations, by Wilson Swain, are amazing. The video below is of me reading parts of the book with him so you can hear how we sing the book. My son loves singing along and watching out for the shark. A federal study[i] found that only 1 in 7 adults are able to read anything more than a children’s picture book or instructions on a pill bottle. World Lit asks: What would you miss most if you could not read or write? There are so many things but my first thought is I would miss sharing adventures with my kids to far off places and whimsical worlds. I'm so glad my children can learn about the world while hearing my voice from the comforts of my lap. What about you? What would you miss most if you could not read or write? I love your website! Thanks for being my newest follower. I am now also following you! Can't wait to look at your wizard of oz post. My son's kindergarten is beginning a Wizard of Oz unit.